I had my one-to-one annual appraisal with the boss the other day. Prior to the meeting, I submitted my usual ‘internal CV’ which detailed how I did against my goals and objectives over 2014 and I had to “rate” my own performance. Work-wise, I didn’t think 2014 was an easy one. For a large part of the year, I was ‘out of my comfort zone’ as I had been nominated to join a project team which involved lots of travel to London, working on a part of the business which I knew next to nothing about. The project ended with a report out to the senior leadership team, which I found quite horrible as I do not like such presentations. I was also ‘dragged’ onto a second project – on this one, I was belatedly deemed to be a ‘Subject Matter Expert’. However, by the time I joined this team, several months had passed since the start of the project, which meant deadlines were really tight. So doing both projects as well as my day job meant that for me, work was just pretty much a blur last year, with weeks just flying by. A good thing I guess, as time didn’t drag, I was never bored. I think I found myself swearing a lot more than I usually do (which the boss occasionally passed comment on as he sits near me…) and at times, I felt as if I couldn’t put 100% into everything and there was the odd goal that I was close to but did not attain. I had a couple of sleepless nights, but thankfully, not too many. I clocked in a few extra (unpaid) hours, mostly early as opposed to late, nothing too drastic to impact my social life, health or well-being, and this was apparent, because I scored a 100% attendance record at work last year – no days off sick at all so I guess I was fortunate not to catch anything worse than a cold and I guess I maintained a good work/life balance. Perhaps those multivitamins I’m taking are doing their job after all, plus I always take advantage of the free fruit provided by the company! However, as my boss noted, stretched as I was and despite feeling at times that I was drowning a little in a sea of work, I still managed to do pretty much everything I was supposed to do. So, how did I rate my own performance? I gave myself a “Met Expectations“. How did my manager rate my performance? “Exceeded Expectations“. So on the back of that rating, it meant that I qualified for a performance-related boost on top of the standard wage increases that were being handed out to all this year. The boss didn’t actually say what the ‘boost’ was but anyway, I’ll be getting an extra 3.15% from April. Nothing to get hugely excited about but I am happy with this because I recall the consecutive years when we got zero wage rises and no performance boosts to boot. For the first time that I recall, I shall also be getting a bonus for the second year in a row, which I shall get in March! As commented in a post by Under The Money Tree about bonuses, in the last 9 years, I’ve received just two bonuses at work. The first one in 2006, it was all blown on a designer watch and a two-week holiday to Gran Canaria. At the time, I had debts to pay off but they didn’t get a sniff of the bonus. The second one I received (last year), I put 90% of it into my SIPP and treated myself to one item of clothing. This year’s bonus won’t be as big as last year’s but it’s still over a month’s salary, so it should, if I save/invest most of it, hike up my savings rate massively. I already know that I won’t be investing all of it – I need to siphon some of it towards my depleted emergency savings and also towards the final payment of my car loan later this year. But the bulk of it will be invested – I’m looking forward to a big boost to my Future Fund! Congrats on all these great news at work. Having a great annual review certainly feels great doesn't it? Great news! Well done. After all that hard work it is nice to be appreciated and get a bonus. Many congratulations on both the bonus and salary increase. The increase is well above inflation so you are now definitely Earning More ,which will help you Save More, bringing that Future Fund target ever closer. Congrats for your 2014 review! I'm sure you well deserve it regarding what you had to do! Keep the good work in 2015 and you will maybe have another raise + bonus in twelve months! Congrats Weenie – sounds like you'll deserve anything you get! Never under sell yourself on these appraisal charades. I work on the basis that they are less likely to score me up than they are to agree with my lower assessment so I always big myself up even when not warrented! Good to hear all your hard work is being rewarded! I have been the same with bonuses as you have in the past, with it mostly going on holidays or home improvements! Put a decent chunk of it last year into the ISA though which was good. 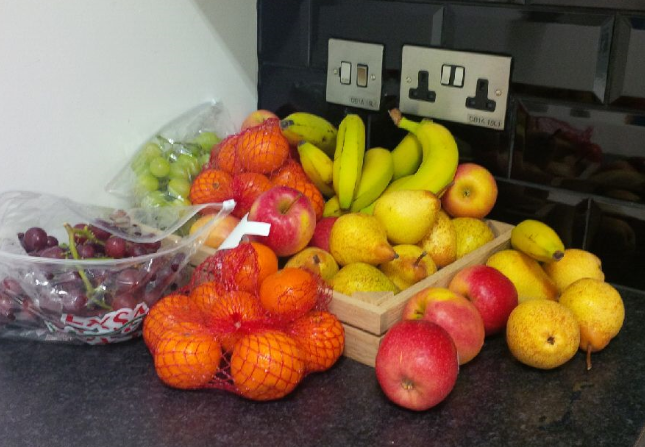 A very small point but we used to get free fruit at work but it's now been stopped. This is the sort of short sighted idiotic thing that wind me up about companies. Was the amount of annoyance that caused amongst employees really worth the £10/week savings they would have achieved? Plus as you alluded to healthy workers are happy and productive workers…! Hi weenie. Great news on the bonus and very well deserved I'm sure. There's no such thing as a bonus in my line of work but at least we have had a pay rise of 2.2% which is an improvement on the last few years. Thanks UTMT and yes, I am usually guilty of underselling myself. I think I've gotten better over the years but I still find it hard to big myself up! Must try harder! Thanks for stopping by! Thanks MP and congrats to you too on your bonus! Fingers crossed that the raises and bonuses will continue! Thanks for stopping by! Thanks RIT, yes while it's not a huge increase, it is above inflation so I am earning more so can save more. Congrats to you too on your bonus – sounds like it's a good one! 🙂 And well done to you too on deciding to save all of it – that will be a great boost towards FI! Fingers crossed you get a good increment! Thanks sparkelbee and yes, it is nice to be appreciated. I'm lucky that I have a good boss who obviously notices the work that I've done. Thanks for stopping by. Thanks Lynx. While money is not the my main motivator, it's nice to be appreciated and rewarded for the hard work. Thanks for stopping by. Thanks Tawcan. Yes, it does feel great – I have to say that I've never really had bad reviews, but I've had some in the past where they have been so-so, where it's obvious I've not rolled my sleeves up and put in maximum effort. If I continue in the way I worked last year, then I should get a good one every year! Hi Cerridwen, thanks and congrats to you on getting your improved pay rise too. Yes, in the past, I would have just enjoyed spending it but I know I will get just as much (if not more) joy seeing it boost up my funds. Thanks TFS. Yes, they introduced the free fruit just over a year ago and it's very popular, yet as you say, hardly costs the company anything. Health and well being is pretty big in our company, so this is part of their plan to help keep workers healthy and cut down sick days. We had a similar situation of annoyance at work a few years back – the then CEO decided to replace all the free coffee machines with new jazzy machines that took tokens that cost 10p each. Granted the coffee was of higher quality but suddenly, everyone was forced to pay for drinks and it caused a lot of grief. These were finally replaced last year with new free machines (and selection of free Twinings teabags) and if anyone wanted to pay for quality coffee, there is a newly installed (and subsidised) Costa franchise in the staff restaurant. Being on the path to FI, I of course, avoid going to Costa haha! Hi FF, thanks and yes, I really do need to big myself up. I've always found it quite hard to 'blow my own trumpet' about my achievements. Perhaps when I see that bonus figure in my wage-slip, I shall take a moment to reflect on it and be proud of my achievements. Thanks for the kind words of support and for stopping by. Fantastic! Congratulations… and how's about buying me a pint when we meet up in stratford 😉 I'll buy you one back! I randomly am being given some extra money at work for something that I thought I was volunteering for. It all seems a bit odd, but extra money is always awesome! Buying each other pints and also swapping home brew…there seems to be a theme for this meet up in Stratford haha! Congrats on you getting some 'random money' – you obviously deserved it! Ha ha, I'm sure the same thing has happened in many offices over the years! Great news on your PA and bonus! Do they really deliver fruit to your work? That's awesome. Thanks May and yes, they do! Although it's popular with most of the people at work, I'd say that some were a little disgruntled that since the fruit deliveries, there are now fewer vending machines selling snacks – the company is trying to send out a healthy message! Thanks for stopping by! Congratulations on the wage increase and bonus Weenie. That's fantastic news! It's always great to get rewarded for the work you've put in. I'm sure you deserve every penny. Thanks Huw! Yes, I recall when you had your bonus and invested it – early estimations of my savings rate are that it won't reach the dizzy heights of 80% but you never know! I can't wait to post it up on the blog!